Silentaire spectrum 2012 is a product that saves one from changing the tips of the brush in order to use different colors. It aids in retouching of a photo in order to get a desirable effect.You are only required to select the colors in advance then the changer is rotated to the desired color as you continue your painting. This machine allows you to apply paint on desired surfaces with more control than ever. It saves you the splatter of ink all over the covered areas but instead enables you to spray and squirt ink all over the place like never before. The Spectrum 2012 Color changer integrated airbrush has transformed the cake decorating industries and painting companies. It has revolutionized art by introducing a short-cut to adding many colors in a drawing while using an installed changer to add more colors. 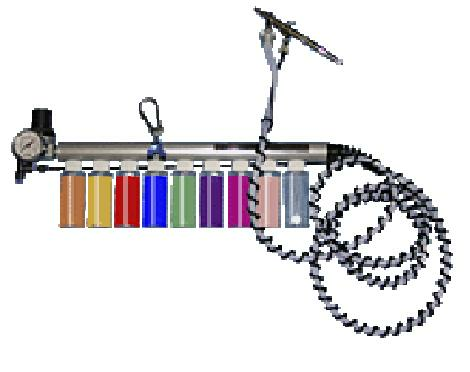 The spectrum 2012 improved product designed by Silentaire technology allows an artist to incorporate many colors from any direction even upside down. The machine is made of premium materials manufactured in the USA with no imitations. The real spectrum cannot be surpassed by any product from other companies. The paint can be pressurized giving one the possibility of achieving many special effects hence the say squirt, splatter and spray like never before. Application does not depend on the direction since one can apply from any direction. Spectrum 2012 can be used in a vertical position and also upside down. The FDA accepts all components meant for application in the field of any edibles. The airbrush that is included in the 2012 version is a Silentaire custom airbrush that we have made specifically for the 2012 version. The inside volume has been reduced significantly to make the color changes quicker and reduce paint waste. This means though that the 2012 version must use this airbrush only and is not compatible with any other airbrushes. This is not a compressors. This is just our color change system that we offer. You will need an airbrush to operate.